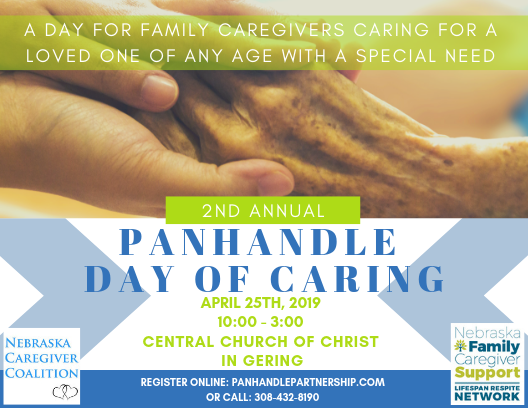 You are invited to the 2nd Annual Panhandle Day of Caring on April 25, 2019 at Central Church of Christ in Gering. The day will include information on the Nebraska Respite Network and Nebraska Caregiver Coalition, Vendors from the area and speakers and networking time. We hope to build on the successful event we held last year. Lunch will be provided, so please RSVP below! If you are a vendor and would like to have a booth at the Day of Caring, please register below!